I really love potatoes, whether they’re mashed, roasted, baked or grilled, they are one of my favourite foods. So, it was only fitting that on the hottest day in oh, say 92 years, I was craving some roasted potatoes. Well, there was no chance that I was going to turn on my oven so I decided to fire up the grill and grill some potatoes. 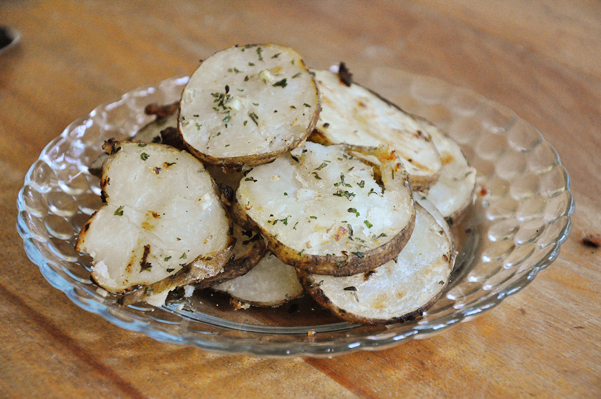 Earlier this year I had stumbled upon a recipe for herb grilled potatoes which sounded delicious and I decided to give it a try, and boy, were these ever good. To me, this seems like a healthier and lighter alternative to the ever present potato salad, and personally, I prefer the grilled potatoes over their doused in mayonnaise first cousin, twice removed. Also, check out the new visual Recipe Index! I have just completely added it to the site, there are different categories such as appetizers, healthy, desserts and baked goods etc. check it out and let me know what you think. Slice potatoes in 1/2-inch thick slices, and cook in a pot of salted water for 10 minutes. While potatoes are cooking, in a small bowl, stir together herbs, garlic, olive oil, salt and pepper. Drain the potatoes and place them in a large bowl. Pour the oil mixture over the potatoes and toss to coat. Transfer the potatoes to a pre-heated grill and grill the potatoes turning once or twice, until tender, about 5 minutes total. Transfer potatoes to serving platter and squeeze lemon over the potatoes and serve. These herb grilled potatoes have to be one of my favourite dishes of the summer so far, what’s your favourite?